A historic benchmark in the annals of solar energy history. The concept is simple – the more heat, the more energy - the higher the temperature, the greater solar thermal potential electrical energy. Solar radiation presents a boundless opportunity for MHD energy conversion. CSPU technology takes advantage of concentrated solar thermal power, creating super hot temperatures that help produce the maximum amount of heat that can be transformed into electrical energy. We propose a novel approach to utilize concentrated solar power for the extremely high efficiency generation of electrical power. Using concentrated solar power to heat a magnetohydrodynamic plasma we will achieve efficiencies in excess of 60%. The efficiency improvement is based on the high temperature of the concentrated solar powered plasma and the extremely high magnetic fields only possible through using high temperature superconductors as permanent magnets. In addition, the requirement of holding the permanent magnetic as close to the magnetohydrodynamic plasma as close as possible is critical to achieving this high efficiency and that will be accomplished through a combination of radiative shielding and microchannel coolers. In the proposed seedling work, we will demonstrate the ability to achieve this extremely high efficiency with the materials and at the temperatures and cooling required for full system functionality. This will be a great improvement over existing systems to convert concentrated solar power.We propose a novel approach to utilize concentrated solar power for the extremely high efficiency generation of electrical power. Using concentrated solar power to heat a magnetohydrodynamic plasma we will achieve efficiencies in excess of 60%. The efficiency improvement is based on the high temperature of the concentrated solar powered plasma and the extremely high magnetic fields only possible through using high temperature superconductors as permanent magnets. In addition, the requirement of holding the permanent magnetic as close to the magnetohydrodynamic plasma as close as possible is critical to achieving this high efficiency and that will be accomplished through a combination of radiative shielding and microchannel coolers. In the proposed seedling work, we will demonstrate the ability to achieve this extremely high efficiency with the materials and at the temperatures and cooling required for full system functionality. This will be a great improvement over existing systems to convert concentrated solar power. Use of Concentrated Solar Power to produce the very hot thermal medium is, in itself, a proven renewal energy source. By integrating CSP with the MHD generator as a topping mechanism we gain a synergism that no other power generator to date possesses. Furthermore by using the high-temperature exhaust plasma to drive a closed-Brayton cycle turbine electricity generator thereafter, we gain additional power output that further amplifies the efficiency of the integrated closed loop system. Our system design is over twice as efficient at converting solar energy into electricity as is conventional photovoltaic collectors. It is our contention that solar MHD is theoretically the most efficient way of converting solar energy into electricity. Solar MHD: A NEW way of converting solar energy into electrical power. Solar MHD generators are thermal-driven; they avoid certain limitations in the conversion of solar energy into electricity commonly found in current solid state solar voltaic cells. Our objective is to introduce to the world and bring to market a new and very efficient new way of converting solar energy into electricity. Solar MHD (magnetohydrodynamics) is at the forefront of science. It is a new, advanced technology for generating electrical power using solar energy. Whereas current state-of-the-art solid state solar voltaic cells have a built-in solar electric conversion limits, solar MHD generators are thermal-driven, and not as limited in their conversion of solar energy into electricity as the solid state solar voltaic cells are. Solar MHD generators have the potential to truly change the world, by vastly improving the state-of-the-art technology for solar electrical conversion. Solar MHD is Free of Pollution. An important advantage of solar MHD, besides the extraordinary conversion efficiency, is the reliability because the channel, its power conversion unit contains no moving parts, and its maximum operating temperature is much higher compared to conventional electrical machines that rely on mechanical shaft power. Therefore, MHD generators are potentially much more efficient than conventional photovoltaic, photo-thermoelectric or steam turbine conversion devices. 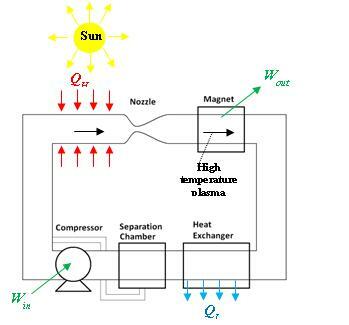 This approach is especially well suited to concentrated solar power where temperatures in excess of 3,000°C can be reached. In addition, the direct conversion of thermal energy to electrical energy eliminates the inefficiencies associated with thermal-to-mechanical and then mechanical-to-electrical energy conversion as well as other dissipative losses. While MHD generators can receive energy from a range of sources, it is perhaps most suited to be used with solar heat energy and Gas/Biodiesel. 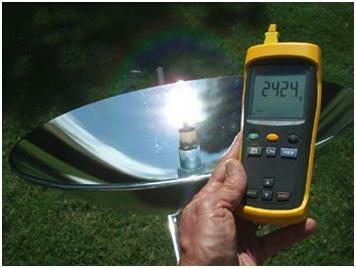 “Solar Concentrators can provide thermal energy at a temperature high enough to provide thermal ionizations. Thus solar- based MHD systems have potential” - International Journal of Scientific and Research Publications, June 2013. Concentrating Solar Power uses mirrors to focus the sun’s energy into high-temperature heat which is used to generate electricity in a generator. Concentrating solar power technologies use reflective materials such as mirrors to concentrate the sun's heat to warm a synthetic liquid to temperatures over 500 degrees Fahrenheit. This fluid heats a liquid that in turns powers steam turbines to produce electricity. Concentrating Solar Power plants use solar radiation as a high-temperature energy source to produce electricity via concentrating heliostats in a thermodynamic cycle. The need for Concentrating Solar Power technology arises because solar radiation reaches the Earth’s surface with a density that is adequate for heating systems but not for efficient thermodynamic cycle needed for electricity production. 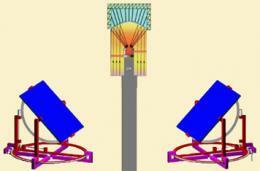 The solar furnace system consist of large 1300mm x 1300mm x t5mm Fresnel lens, which has been divided in 9 pieces. The furnace is able to produce more than 10kW/2500 �‹C at the focal point. Use of concentrated solar energy to produce the very hot thermal medium is, in itself, a proven renewal energy source. By integrating CSP with the MHD generator as a topping mechanism we gain a synergism that no other power generator to date possesses. Furthermore by using the high-temperature exhaust plasma to drive a closed-Brayton cycle turbine electricity generator thereafter, we gain additional power output that further amplifies the efficiency of the integrated closed loop system. 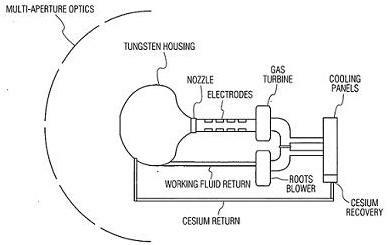 Schematic diagram of a prototype concentrated solar power MHD power generation system. It should be noted that a Hughes Space and Communications Company physicist, J. Palmer's solar MHD benchmark experiments done in the 1970's in California, using solar energy to ionize a plasma, proved the concept that solar MHD could work for the first time. Solar MHD technology can help humanity by helping us meet our rapidly mounting demand for non-polluting ways of generating electricity.